The Coppinger name returns to Midleton! John Joseph Coppinger of Midleton as an officer in the US Army during the American Civil War. About nine months ago we posted a discussion on the work of the Gothic Revival architect AWN Pugin in the Midleton/Dungourney area. 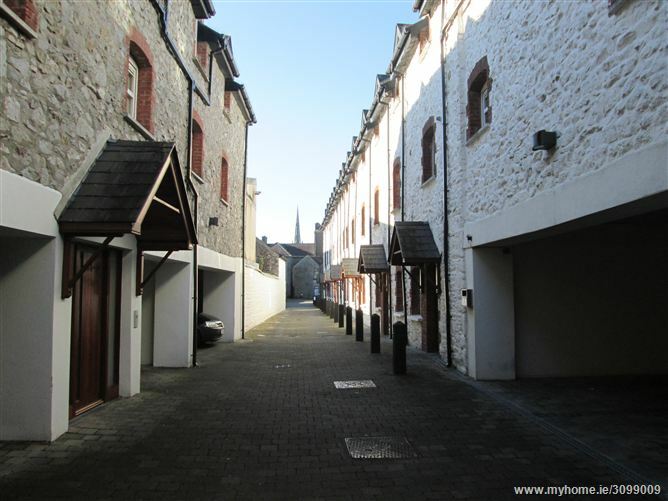 The pair of townhouses designed by Pugin on Main Street, Midleton were then up for sale. The good news is that the building has been purchased and thoroughly refurbished. The exterior stonework has been repointed, probably for the first time since the 1850s. The interior has been splendidly designed to provide Midleton with a fine, even metropolitan bar, exceptional in an Irish country town. Wonderfully, Pugin is celebrated by a portrait and several copies of his architectural drawings in the Smoking Room. On Holy Thursday, 24th March, it reopened as J.J. Coppinger’s bar. The name comes from General John Joseph Coppinger, the Midleton man who joined the US army to fight in the American Civil War. J.J. Coppinger is buried in Arlington National Cemetery, Virgina. The new bar displays two walls of images and memorabilia depicting the American Civil War. It’s wonderful to see the Coppinger name return to Main Street, Midleton, for the first time since 1931. The new bar is located just yards from the original Coppinger brewery which was founded in the mid-1790s. Searching for Midleton’s ‘lost’ 19th century brewery. View of Drury’s Avenue through the archway under the granary which marks the north-eastern boundary of the site of the ‘lost’ brewery. This archway seems to be too low to be the main entrance to the brewery. Very likely the entrance was on Charles Street, now Connolly Street. When researching the history of Midleton, one must admit that it can be very frustrating trying to put together an accurate picture of the town’s past. There really must be something in the local water supply that allows people to forget that there were once TWO distilleries in Midleton. And there were TWO breweries. As already noted on this blog, Midleton had a brewery established and run by the Coppinger family from at least the 1790s to the late 1830s when it closed, probably under pressure from Fr Theobald Mathew’s temperance campaign. The site and the main brewery building are still extant at the southern end of Main Street. 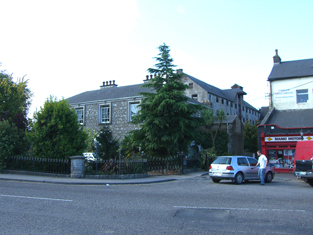 In his Topographcial Dictionary (1837), Samuel Lewis mentions ‘….two very large breweries and two extensive malting establishments….’ We know that the malting establishments were in Ballinacurra, and one brewery was the Coppinger establishment in Midleton, which was noted by the Ordnance Survey in its first edition six inch map of the town c.1843. But the Coppinger brewery had closed by then. William Shaw Mason’s Statistical Account or Parochial Survey of Ireland (Vol 3), from 1819, notes only one brewery in Midleton. So where was the other brewery mentioned in Lewis? 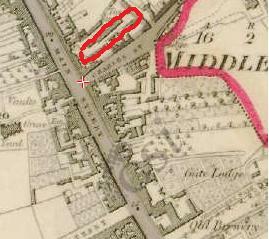 Midleton’s ‘lost’ brewery (outlined in orange) was located between Main Street and Drury’s Lane (now Drury’s Avenue) but seems to have closed as a brewery before the first edition six inch Ordnance Survey map of the town was published. The ‘Old Brewery’ at the bottom of the map was the establishment of John and Joseph Coppinger. A gentleman who joined my second Heritage Week walking tour of Midleton’s commercial and industrial heritage on Sunday 30th August has supplied me with information from the preliminary maps made by the Ordnance Survey. These preliminary maps or surveys were never published, but they do show the presence of a brewery on a site just off Main Street. It seems the site of the brewery stretched from Main Street to Drury’s Lane (now called Drury’s Avenue, although it is still a laneway in its dimensions). It seems that the premises on Main Street may have been a public house or a shop selling beer. Because the old archway into the site from Drury’s Avenue is so low, it is likely that the entrance to the brewery was almost certainly on Charles Street (no Connolly Street), at the former Tattan’s Yard, now redeveloped into an apartment complex called Granary Court. The granary referred to by this name is actually located on Drury’s Avenue and stretches down both the northern and southern side of the site. The large building is now converted into apartments. Almost certainly part of this was actually a malthouse for supplying malt barley for brewing. The site of Midleton’s ‘lost’ brewery was a long narrow town plot with tall maltings and grain stores on each side. Behind the building on the right was a tannery. The buildings are now converted into apartments. The spire in the distance is that of St John the Baptist’s Church (Anglican). The archway noted above would be located behind the viewer. The key difficulty now presented to us is to identify the owner. Pigott’s directory of 1824 gives us John and Joseph Coppinger as brewers and maltsters in Midleton. But it also gives us John Lomasney as a maltster. No address is given for him so we must presume that, like the Coppingers, he was based in Midleton itself rather than in Ballinacurra. To make matters even more interesting, the adjoining plot to the north of this brewery was a tannery. One can hardly imagine two less congenial neighbours. Obviously the brewers had to ensure that their water supply was not contaminated by runoff from the tannery. Two things come out of this. First is Lewis’s description of TWO…’..very large breweries…’ in Midleton. The scale of the buildings remaining on this second site seems to support this. 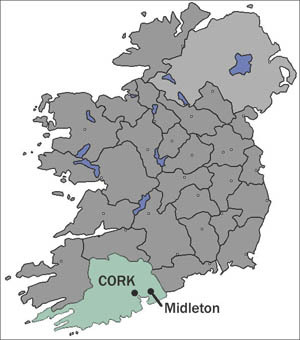 Midleton could easily have developed into a major brewing center in County Cork. Secondly, the fact that the second brewery seems to be omitted from the local memory or even the local record is striking, almost as if the town wished to forget its association with brewing, whilst acknowledging its links to distilling. There’s more work to be done on this! Watch this space! I wish to acknowledge the assistance of Caen Harris in providing valuable information for this post. Midleton House and, er, the other Midleton House…..a tale of two houses and one name. Midleton House at the southern end of Main Street only acquired the name around 1896 when the Ordnance Survey noted it. This was the house that almost led to the present author being ‘handbagged’ in August 2014! Note the huge grain store at the extreme left of the picture, behind the house. Until the 1930s it was the residence of the Coppinger family. During a tour of Midleton during Heritage Week at the end of August 2014, I was nearly handbagged by a group of ‘Old Midleton’ ladies who’d joined the tour. Their outrage was sparked by my use of the name ‘Midleton House’ while referring to the very first house at the southern end of Main Street. But this was not the building standing across the river from it that ThEY called Midleton House.You will be glad to know that handbags were not employed on this occasion, because I managed to deflect their collective ire by promising them a juicy piece of gossip! 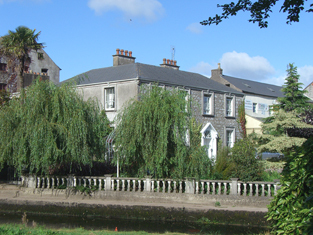 One of the mysteries of Midleton is why the town has two houses, each called Midleton House, facing each other across the narrow Roxborough or Dungourney River. Now there are a lot of people in Midleton who would object that the above statement is factually incorrect – like the ladies on my tour, they would assert, beyond any fear of contradiction, that there is only ONE Midleton House. Well, let’s look at this matter more carefully. So, it’s time to examine why Midleton has two houses with the same name apparently glaring at each other across the river. The first thing to note is that the first edition Ordnance Survey map shows both houses in the 1840s. But only one house is actually named – this is the house on the southern bank of the Roxborough or Dungourney River. 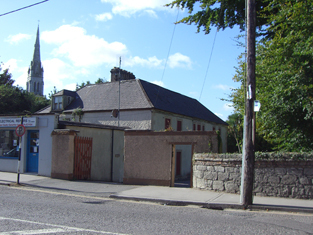 It is called Lewis Place – a name that is virtually unknown in Midleton, despite the fact that the house is located next to Lewis Bridge. The lawn at the front of the house contained a well – Lewis Well, now covered over and entirely forgotten. Recorded on the first edition Ordnance Survey map as Lewis Place, this mid-18th century house on the south bank of the Roxborough River acquired the name Midleton House by 1856. It was the residence of the Greene family from the 1790s until the early twentieth century. It is currently boarded up and for sale. One might ask who was Lewis? That a house, bridge and well should be named after him suggests someone of improtance. The answer is that we simply don’t know, although Charles Smith’s History and Character of the the County and City of Cork (1750) notes that some of the monuments in St John the Baptist churchyard (C of I) bore the family name Lewis. So the family must have been resident in the town or parish into the middle of the eighteenth century. And this is important, for clearly the house is older than its earliest recorded deed from the 1790s, when it was leased to Rev Mr Greene, a onetime Sovereign of Midleton. 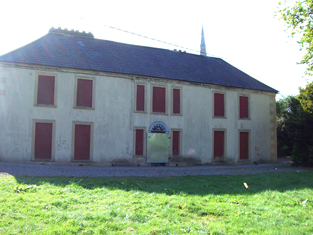 The slope of the roof and the placement of windows and door at the front suggest that it even LOOKS older, with a bit of gentle modernisation around 1800. I suspect that a date somewhere between 1750 and 1760 is about right. At one point this house enjoyed a view right up the entire length of the Main Street towards the mill at the northern end of the town. 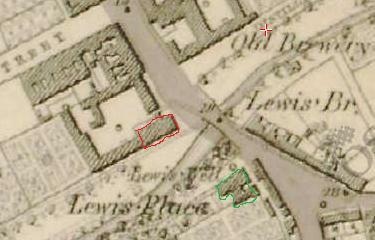 First edition Ordnance Survey map of Midleton showing Lewis Place (outlined in green) on the south bank of the Roxborough or Dungourney River and the Coppinger residence (outlined in red) on the north bank at the end of the Main Street. Sadly, the view is no longer open because the trees and shrubs planted in the front garden of the house across the river have grown up to block the vista. THAT house is clearly a much later building than Lewis Place. The size and disposition of the windows and door, as well as the shallower slope of the roof, and the good manners of the house in following line of the western side of the Main Street all suggest a building from about 1790 – 1800. Behind this building is a large yard and a huge grain store, about six to seven storeys in height. Until the 1930s the yard was known as Coppinger’s Yard thus revealing the name of the family that developed the site at the end of the eighteenth century. This house was NOT not given a name in the first edition Ordnance Survey map. It is worth noting that Coppingers Brewery stood across the Main Street from the yard. Midleton House is the name given to BOTH the Coppinger house on the north side of the river and the Greene house, formerly Lewis Place, on the south side of the river in 1896. Surprisingly Lewis Well is still there in the middle of the lawn! Returning to our Ordnance Survey maps, but this time to the 1896 25-inch survey of Midleton. BOTH houses are called Midleton House on the map! This is why I believe that the former Coppinger residence at the southern end of Main Street is entitled to be called Midleton House, along with the former Lewis Place across the river. Sadly it would appear that nobody in the council bothered to look at the Ordnance Survey maps! It might serve to give some history of the occupation of the two houses. First, Midleton House, The Rock, formerly Lewis Place, on the southern bank of the Roxborough River. As noted this is clearly the older of the two houses by several decades. From the 1790s it was the home of the Greene family who developed most of the western side of St Mary’s Road (at one time to the dismay of Lord Midleton’s agent!).. Pigott’s Directory of 1824 gives us the information that the Rev Wm Greene, LLD, Rector of Tullilease (in north County Cork) resided in Midleton, under the heading of ‘Nobility, Gentry and Clergy’. The name or precise address of the house is not given and there is no mention of the name Lewis Place anywhere – remember this was BEFORE the first edition Ordnance Survey map was produced. Mr Greene’s near neighbour was the Rev William Maunsell, Archdeacon of Limerick, residing at Midleton Lodge (now the council offices). In 1856, Slater’s Directory gives the detail that Rev William Greene, LLD, resided at Midleton House. Now this is the ONLY Midleton House noted in the Directory. So shortly after the Ordnance Survey completed their survey of Midleton the name Lewis Place was changed to Midleton House. It is not at present known if Viscount Midleton gave his consent to this change. 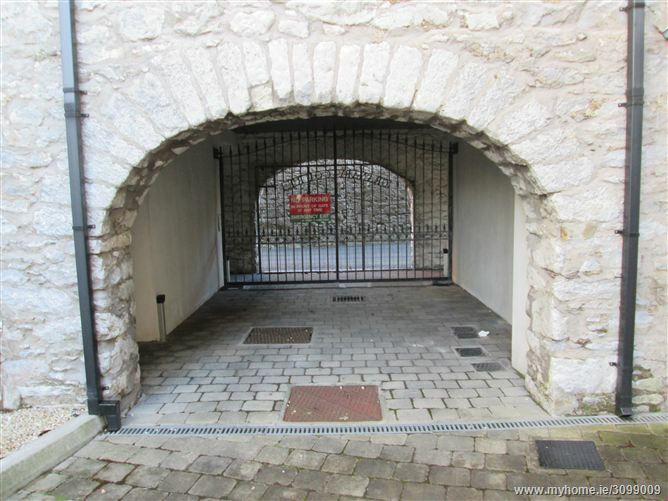 Mr Michael Greene’s gate, the entrance to Midleton House, The Rock, where two constables were shot by the Fenians under Tim Daly in 1867. Three of the constables took refuge in Mr Greene’s house. The other house, at the southern end of Main Street, on the north bank of the Roxborough River, was built by the Coppinger family between 1790 and 1820 (more likely at the earlier part of this period). The Coppingers were the wealthiest Catholic residents of Midleton from the late eighteenth century to the early twentieth century. Thomas Stephen Coppinger is noted as a merchant in Piggot’s Directory of 1824, while John and Joseph Coppinger are identified as brewers and maltsters. Thomas Stephen lived in the unnamed house marked on the first edition Ordnance Survey map, with his grain store and yard behind the house. However, by 1842, Thomas Stephen Coppinger, now a Justice of the Peace, had moved to Midleton Lodge and a Richard Coppinger, merchant, is noted as living in Midleton almost certainly in the former residence of Thomas Stephen Coppinger. The view from the former Coppinger brewery. Midleton House, Main Street, was the center of a major grain exporting, and later a coal importing, business conducted by the Coppinger family. Note the huge grain store peeping over the side of the house. The metal railings in front are original. The building on the right of the picture also belonged to the Coppingers. In Slater’s Directory of 1881 Thomas Coppinger Esq, JP is resident at Midleton Lodge, but we now see TS & R Coppinger, as corn merchants on Main Street – presumably in the original Coppinger residence backing on to their grain store. By 1897 TS & R Coppinger of Main Street were now coal merchants and seed and manure merchants, a business they ran into the twentieth century.. Note that the house on Main Street is not given a name in these directories, yet the name Midleton House appears attached to this house on the 1896 map. It seems highly unlikely that the Ordnance Survey made a mistake – it is far more likely that the managed to correctly ascertain the name of the Coppinger house. Thus, according to the Ordnance Survey of Ireland, we DO have two houses on the banks of the Roxborough River bearing the name Midleton House. One clearly had the name since the mid-1850s, but the other acquired the name by 1896. Somehow I don’t think the Midleton Post Office required postcodes to ascertain which letter was destined for which house!